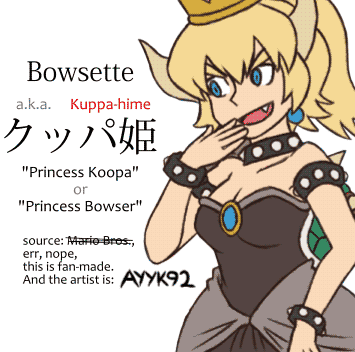 For reference, the Japanese name for Bowsette is Kuppa-hime クッパ姫, literally "Princess Koopa," and I'm writing this post, of course, because I think it's funny how the English name Bowsette and the Japanese name Kuppa-hime have almost nothing to do with each other. So, someone made a comic featuring Bowser from Mario Bros. turning into a princess. You know, the bad turtle dude who kidnaps princesses? Yeah, that dude. He's become the very thing he had sought to destroy. Unforeseeable for the artist, it turned viral, and within the same week there's already so much fan-art of her spammed through all corners of the internet there's already people sick and tired of seeing it wishing for the fad to end already. And the reason for this popularity, as seen above, is oppai. And a villain attitude, maybe, but mostly oppai. I mean, seriously, it's been only 7 days and there's already over 4000 pieces of fan-art on Pixiv alone. That's like, 1 new fan-art every 2 minutes. Her own subreddit, /r/bowsette, is already full of lewds, 99% NSFW, and people are already arguing whether the dark-skinned redhead Bowsette is better than the blonde one. Nobody could've planned for this. So the comic author didn't pick a name for the female Bowser he's created. And the comic was in English. So the English-speaking fandom scrambled for a name. Deciding on Bowsette or Bowserette. They chose these names probably because of the game the comic was parodying: New Super Mario Bros. U Deluxe , for the Nintendo Switch. 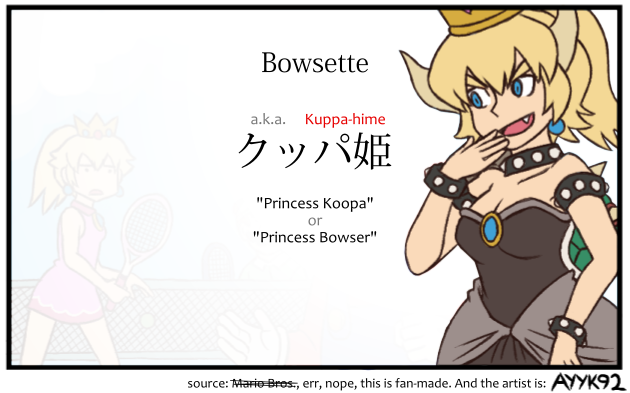 Anyway, the Japanese-speaking fandom also noticed this new Bowsette character, except they settled on the name Kuppa-hime クッパ姫 instead. Bowsette isn't canon. It's a design a fan came up with in a piece of fan-art. And now there's fan-art of that fan-art. It's like the same thing that happened with Earth-chan except this time it's probably making a copyright lawyer lose sleep somewhere. But what's important is: there's no official name, English or Japanese. As you can see, the Toadette and Peachette names that served as reference point for Bowsette and Browserette don't exist in Japanese. So those names wouldn't make sense for the Japanese community. Wow, Bowser's name was actually Koopa all along. Which makes the fact the cannon shoe fodder turtles, the "koopa troopas," are sometimes called "koopas" rather awkward. And this is why Bowsette is called "Princess Bowser," a.k.a "Princess Koopa," Kuppa-hime クッパ姫 in Japanese: because "Bowser" in Japanese is Kuppa クッパ and the crown makes you like the "Princess Peach," Piichi-hime ピッチ姫. You may have noticed that Bowser is a king, so maybe Bowsette shouldn't be "Princess Bowser" but "Queen Bowser," or "Queen Koopa," Kuppa-joou クッパ女王. However, that character already exists, and it's canon. Other characters also got "peachfied," even the ones that don't look at all human—so I suppose this is a kind of moe anthropomorphism? And they count as monster girls? I'll be writing the names of some of the most popular ones below. They're pretty much the Japanese names of the Super Mario characters of the character plus the -hime suffix. The Japanese name for Booette, a.k.a. Princess King Boo, Queen Boo, or Boosette, is Kingu-Teresa-hime キングテレサ姫, literally "Princess King Teresa," which is rather weird, but I'll explain. In Japanese, King Boo is called Kingu Teresa キングテレサ, "King Teresa," which might make you think his (wait, her?) name is Teresa, like some sort of Spanish name, but that's not it. What happens is that Teresa テレサ is the Japanese name for the "boo" ghost characters. A common trait of the boo ghosts is that they're shy and cover their faces when you look at them. "Feeling shy/embarrassed" in Japanese is tereru 照れる, while tere-sa 照れさ is literally "shyness." The Japanese name for the Piranhette, a.k.a. Princess Piranha Plant, is Pakkun-Furawā-Hime パックンフラワー姫. The name of the character, pakkun-furawā パックン・フラワー, is the mimetic word for closing your mouth strongly, pakkun—you know like the plant does as it tries to bite you—followed by the katakanized English word "flower," furawā フラワー. So more-or-less "biting flower" or something like that. The Japanese name for the Chain Chompette, a.k.a. Princess Chain Chomp, is Wanwan-hime ワンワン姫. Now this is kinda rather awkward, because Chain Chomp's Japanese name turns out to be the onomatopoeia for the barking sound dogs make: "woof-woof," or "bow-wow," wanwan ワンワン. That's right, Chain Chomp was originally called "woof-woof," so the princess version is now then "Princess Woof-Woof." Now, the reason for this official name is probably because Chain Chomp is like a dog that is chained somewhere and starts barking, wanwan, when you come closer. Uh... Bullet Bill's Japanese name is the katakanization of "killer," Kirā キラー, you know, like the one from Death Note. So Princess Bullet Bill... erm, Bullet Billette? Bulletette? Whatever, would be Kirā-hime キラー姫, "Princess Killer," or you could even spell it Killer-hime. Blooper's Japanese name is Gessō ゲッソー, so Blooperette would be Gessō-hime ゲッソー姫. If you don't recall who Blooper is, it's the squid enemy. If you don't recall who the squid enemy is, well, then go play Mario. This one's name seems to come from the word geso 下足, the kanji means "lower legs," but the word refers to "squid tentacles." The character is a squid, you see. It has tentacles. Yoshi's Japanese name is... Yoshī ヨッシー. So Yoshiette's Japanese name is literally "Princess Yoshi," Yoshī-hime ヨッシー姫. A Princess Goomba would be a Goombette, but that's already the official English name for a different character that's the female version of the Goomba, so watch out. Anyway, the Japanese name for the Goomba is Kuribō クリボー. That's right, Kuribō! It's literally the same name as the Kuribou クリボー from Yugioh, except I romanized it differently. So the Japanese name for the Goombette would be Kuribō-hime クリボー姫. The Japanese name for the Thwompette is Dossun-hime ドッスン姫, "Princess Thwomp." And Thwomp's Japanese name is then Dossun ドッスン, of course. Oooohhh... the block thing that keeps falling and kills you. Of course. And Dossun ドッスン is called dossun because that's the sound it makes as it hits the ceiling, do-, and then starts falling, -ssun, to smash the floor. In English this has been called Peachification, Peachfication, or Peach-fication.